A group of street musicians gathered in front of a brick wall playing congas and jembes to passers by stopping to listen to the reggae rhythms at Notting Hill Carnival in London in 1989. 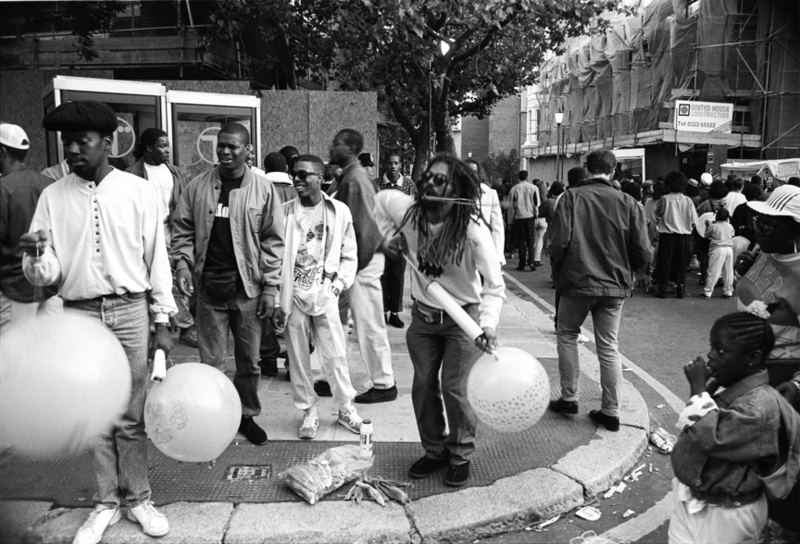 A sound system promoting racial equality plays its music to passers by at the Notting Hill Carnival in London in 1989. A white man dressed in a blazer with a conventional haircut looks at a food stall offering traditional Jamaican food while two black man nervously keep an eye on what is going on out of the frame of the photograph. A massive racially diverse crowd gathered to listen and dance to a popular sound system during Notting Hill Carnival in London in 1989. 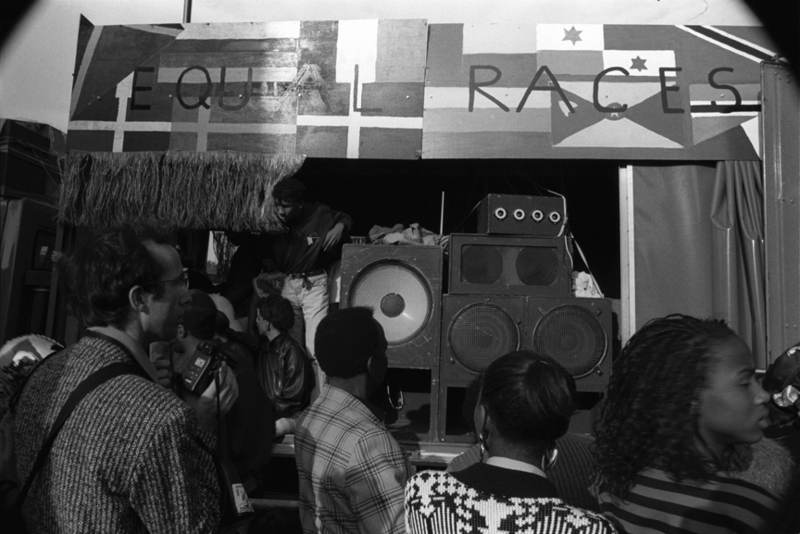 A sound system on All Saints Road in Notting Hill, once the most most CCTV’ed road in the UK, plays its music to the crowd at Carnival in 1989 in front of a banner depicting black people in front of the Union jack flag drenched in red symbolising blood as a reference to the treatment meted out to the afro Caribbean community by authority. A steel drum band on a lorry carnival float at Notting Hill Carnival in West London in 1989 plays music as it passes by. A young man in a leather hat watches the crowd in a street below from a large lorry containing a big steel drum band playing music as it slowly makes its way through the assembled people in the street at Notting Hill Carnival in west London in 1989. A mobile sound system in a lorry surrounded by a large crowd of people punching salutes in the air in response to the music as a wave of adrenalin and fun created by the atmosphere sweeps though the people listening and dancing nearby. Two girls pose for the camera in front of a sound system as a man passing by dancing to the music inadvertently obstructs its view to the right of the frame making an interesting image of Notting Hill carnival in London in 1989.